I Want to Believe. Mysterious, Marfa, Texas. In May 2014, Savannah and I decided to spend the weekend in Marfa, Texas. She had always wanted to visit the town, and I was curious about the Marfa Mystery Lights. Coincidentally, the only chance for decent storms that weekend happened to be in southwest Texas. We got up in the morning, packed the car, and hit the road for Marfa. It took about 7 hours to get there from Central Texas. When driving through West Texas, you want to time your traveling accordingly. You will be driving long stretches through the middle of nowhere. Some places take advantage of this fact, like the town of Ozona, where a unkempt motel room will easily run you $150. We arrived in the high desert of the Trans-Pecos in the late afternoon, just as storms were firing. We drove through a few of them in the mountains and came out on US 67 just east of Marfa, which is where the Marfa Lights Viewing Platform is located. The last storm of the day fired right there, complete with a ton of lightning and a nice shelf cloud over a passing Union Pacific locomotive. El Cosmico. The Weirdest Place This Side of Austin. We reserved a spot at El Cosmico, a campground on the south side of Marfa that offers trailers, teepees, and primitive camping. El Cosmico is a very unique place, which has the feel of being aimed towards people between the hippies of sixties and the hipsters of the today. There is a small shelter which holds a community outdoor kitchen, with refrigerators, grills, and sinks. The restroom situation was different, as it was also a community ordeal that offered little in the way of privacy. We actually ended up getting our showers during the duration of our stay at a small campground up the street, which allowed us to use their facilities with much more privacy for $5. Well worth the price for 3 walls and a shower curtain surrounding you in a brick and mortar building. There is also a gorgeous hotel in downtown Marfa called The Hotel Paisano. It's a fully restored hotel from the 1930's, where movie stars James Dean and Elizabeth Taylor stayed while filming for the movie Giant. Rates run about $170 per night for a regular room, although you're going to want to book well in advance. We drove to the Prada Marfa installation on our first night there. The building is actually in the town of Valentine (35 miles east of Marfa on Highway 90). Be sure to have enough fuel for the 70 mile round trip because there is absolutely nothing in Valentine. The installation was vandalized in March 2014 by some assholes that tried to pass the act off as art of their own. The building was mostly cleaned up by the time we visited, after blue paint was shellacked across the outside and pamphlets were cemented to the windows, although the awnings still remained torn. On the way back into Marfa, we stopped at the Stardust Motel, of which only the sign remains. It made for a nice image with the Milky Way exploding in the sky behind it. I love this part of Texas. The stars are visible all the way down to the horizon with an endless array of interesting foreground options. It's this reason I chose the high desert of the Trans Pecos to host my first astrophotography workshop. Read more about that here. "The Marfa Mystery Lights are visible on many clear nights between Marfa and Paisano Pass as one looks towards the Chinati Mountains. The lights may appear in various colors as they move about, split apart, melt together, disappear and reappear. Robert Reed Ellison, a young cowboy, reported sighting the lights in 1883. He spotted them while tending a herd of cattle and wondered if they were Apache Indian campfires. Apache Indians believed these eerie lights to be stars falling to the earth. Many viewers have theories ranging from science to science fiction as they describe their ideas of aliens in UFO's, ranch house lights, St. Elmo's fire or headlights from vehicles on US 67, the Presidio highway. Some believe the lights are an electrostatic discharge, swamp gases, and moonlight shining on veins of mica, of ghosts of Conquistadors searching for gold. An explanation as to why the lights cannot be located is an unusual phenomenon similar to a miracle, where atmospheric conditions produced by the interaction of warm and cold layers of air bend lightso that it can be seen from afar, but not up close. The mystery of these lights still remains unsolved." We saw the Marfa Lights, the tourist version of them at least. It is likely that they are simply distant car headlights along US 67. 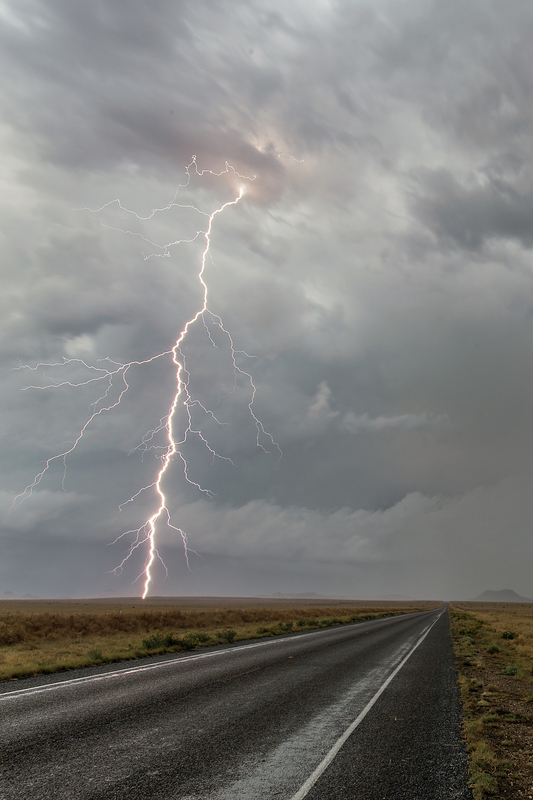 This article in Texas Monthly goes into detail about how what most people see are headlights along the highway, yet locals claim to have seen the "real" Marfa lights in experiences that sound like scenes from the sci fi flick Fire in the Sky. Some tips for visiting Marfa. If you're going to camp while there, make sure you bring plenty of food. There is a small grocery store in town, as well as a few gas stations, but goods are fairly expensive out there. Be sure to stop by the visitor's center to get information about the restaurants in town, which are open only on certain days, and for odd hours. The best place we found to eat was Alice's Cafe because it was open most of the times we were hungry, but the food was great regardless. Fast, reasonably priced, clean, and great service. Alice's Cafe serves breakfast, lunch, and dinner. There is also a great food truck that sets up downtown called Food Shark that was very popular. Plan your visit out well in advance, and make your reservations accordingly. The Hotel Paisano was totally booked during our stay, as it was during their peak season. Even spots at El Cosmico were tough to get, with the tents and trailers fully booked. Bring the right attire. You are in the desert. Even though temperatures were topping out in the 90's during the day, it got very chilly at night, with temps dipping down into the 40's. Check the forecast before you go.